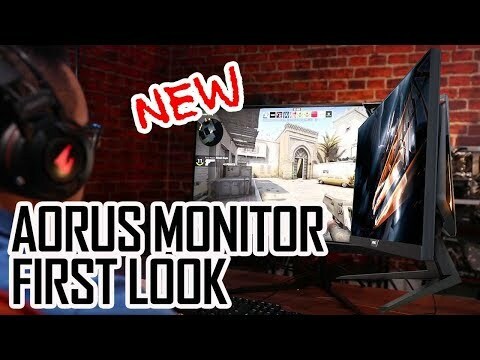 The World's First Tactical Monitor The AORUS AD27QD is the world’s first tactical gaming monitor bursting with innovative AORUS-exclusive gaming technologies, which deliver ultra-smooth gameplay and offers intelligent game enhancements. This 27-inch QHD monitor with 144Hz refresh rate, supports AMD Radeon FreeSync Technology, which erases choppy gameplay giving gamers an unbelievable performance. Featuring built-in digital LEDs in multiple zones, with total RGB customizability as you can personalize your monitor with stunning colours straight from the RGB Fusion App. This advanced IPS monitor displays clear images with 10bit HDR colour accuracy all at a super responsive time of 1ms. The design concept resembles the falcon's aerodynamic wings and the ergonomic futuristic style allows you to adjust the monitor to your desired angle so that you can game in pure comfort. the stunning falcon inspired design concept The falcon utilizes its powerful wings to soar through the skies and lock down its prey. The AORUS Core takes inspiration from the falcon’s aerodynamic wings, incorporating a multi-layered design which features wing shaped contours and also resembles the falcon’s high velocity ascension and dive through the skies. With sleek and metallic armor, the AORUS Core symbolizes advancement in technology with its futuristic style. QHD with 144hz supports freesync™ technology AORUS AD27QD features a 27” Quad HD panel at 2560x1440 resolution in a 16:9 aspect ratio with a 144hz refresh rate, delivering double the details and display quality than Full HD. Enjoy games and movies in their original size. AMD Radeon™ FreeSync technology effectively ends choppy and fragmented frames, and creates a smooth and artifact-free performance at any framerate. 1ms response time without any ghosting effects The AORUS AD27QD is one of the greatest receptive gaming monitors in the market. By quickening the twisting speed of the liquid crystals, the response time can be condensed to 1ms, allowing you to enjoy a smooth gaming experience minus any ghosting effects. This feature is mostly beneficial with high tempo games. 10bits colour ips | 1,000:1 contrast ratio The AORUS AD27QD uses an advanced 10bits(8bits+FRC) Colour IPS display technology which gives you extra wide viewing angles with 178/178 degrees. While in fierce competitions, the AD27QD's smooth rending ability will deny any chance of ghosting effects and lead you to victory. feel the true colour 95% dci-p3 DCI-P3 is a common RGB colour space for digital movie projection from the American film industry. Compared to sRGB, DCI-P3 covers more red and green, which is more powerful and sharper, allowing more realistic colours. With HDR technology, provides users with richer colour levels. expand the colour range with HDR High Dynamic Range (HDR) provides enhanced contrast and vibrant colour accuracy, paralleled to Standard Dynamic Range (SDR) displays. HDR is gaining interests from a wide range of applications, including gaming, movie entertainment, and creation of multimedia content. The aim is to let the human eye see the picture as real as possible. built-in digital leds create lighting effects The AORUS AD27QD Gaming monitor features the finest innovative LED systems in the market today. With the RGB Fusion App, you can create the perfect gaming ambience exclusively to you, with its intuitive UI and Advanced Mode for extreme customizability. LED enthusiasts now have the chance to show off their creativeness with the ability to customize multiple zones independently, choose from nine plus different lighting effects. Aim stabilizer gives you a stable aim AORUS Aim Stabilizer eases motion blur and allows gamers to uphold astonishing clarity in the game for a smoother experience. In FPS games, firing a shot will produce an abundant recoil which will shake the screen and cause the picture to distort. The Aim Stabilizer can deflect the motion blur and improve the gamer's visual clarity, allowing them to trace the bullet path and control the aim more easily. With dashboard, info won't be blocked by games AORUS Dashboard shows you vital hardware information in immediately such as CPU voltages, clock speed, temperatures, usage, fans speed and other AORUS exclusive functions, such as GameAssist. Whatever the situation, you will not be obstructed by any game and you can even modify the information that you want to show. adjust the blackness level with black equalizer Black Equalizer can control the shadow of the display to boost the contrast and increase the prominence of the dark scene without overexposing the bright area. In the game, Black Equalizer will intensify the details of the dark portion without disturbing other display regions, allowing you to easily catch enemies hiding in the dark. enhance your gaming skills with gameassist GameAssist gives you the skill to create several custom crosshairs and assist you, especially when playing a shooting game and the in-game crosshair isn’t available. Onscreen timer keeps track of elapsed game time. Gaming counter helps calculate the rival's use of props or count information. The display alignment function gives users multi-alignment lines on the monitor. set osd with a mouse The exclusive AORUS OSD Sidekick allows you to set the display options with keyboard and mouse. This gives you the privilege to adjust the options swiftly without using the buttons on the monitor. AORUS also provides firmware updates and backups for this monitor, so you can enjoy new features and make your sidekick smarter with protection. aorus unique ic design Smart close-talk voice capturing technology with dual mics perfectly cancels out the environmental noises/sounds with the least voice distortion, letting your teammate receive your voice clearly. Not only traditional (CASA) techniques, but also combined with Acoustic Physics & Psychoacoustics, processing your voice through a wideband DSP chip and brings you the best communication convenience and privacy anywhere. switch between video sources with pip and pbp Picture-in-picture (PIP) and picture-by-picture (PBP) features on the AORUS AD27QD gaming monitor. The functions allow users to view different video sources which are presented in one screen at the same time; as for the audio, users can switch between the main source and the PIP/PBP source whenever they want. So, when you are playing games with the main screen, you are able to watch the game guides at the same time using only one monitor. Blue light reductionThis AORUS Gaming monitor passed the test to obtain the TÜV Low Blue Light Content logo. Comparable to ultraviolet radiation, visible blue light is the portion of the visible light spectrum with the shortest wavelengths and highest energy. If there is no blue light filtering function, long-term use of the monitor will cause eye damage. Flicker-Free TechnologyThe Flicker-free technology eliminates flickering at all brightness levels and effectively reducing eye fatigue. 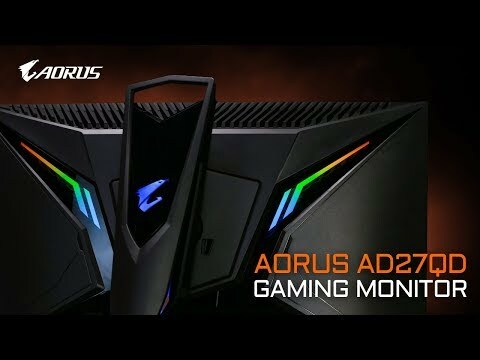 The AORUS AD27QD Gaming monitor provides a more stable LED light source, allowing players to play the game for a long time or watch the movie without causing eye strain to give a more pleasant viewing experience. USB ChargerThis AORUS Gaming monitor is equipped with ON/OFF Charge technology which allows you to Quick Charge your mobile devices, the AD27QD embeds a SuperSpeed USB charger which provides 5V/1.5A power for your devices even when the monitor power is off. Power Board Built-inThe AORUS AD27QD Gaming monitor provides various easy-to-access ports and jacks. The AD27QD's power supply is integrated with the panel, there is no additional bulky adapter needed, making it easier to move and setup. 2x HDMI 2.0 | 1x DisplayPort 1.2 | 2x USB 3.0 The AORUS AD27QD Gaming monitor is Kensington-Lock Ready with a audio jack and a mic jack. Included accessories: 1x Power Cable, 1x HDMI Cable, 1x DisplayPort Cable, 1x USB Cable, 1x Support CD and Quick Start Guide. Ergonomically designed The AORUS AD27QD Gaming monitor’s features a exclusive stand that's ergonomically designed to offer an extensive range of height, tilt, pivot, stroke, and swivel adjustments. 27" AORUS AD27QD Monitor, IPS, HDR, 2560x1440, 144Hz, FreeSync, 1ms, 12M:1, 350cd/m², HDMI/DP is rated 5.0 out of 5 by 5. Rated 5 out of 5 by Jampot from Great monitor but will not pre -order anything from Scan in future You only get notified late afternoon, on dispatch day that the item will be delayed. Then when a further delay comes around, Scan will just update it on there website and not notify you at all. I have never had a problem with any products I've purchased from Scan but the communication regarding pre-orders could be a little better. Great monitor anyhow and no regrets at all! Rated 5 out of 5 by morbo186 from Quality 1440p 144hz monitor from aorus I bought this monitor after looking at a few in this price range and I am completely satisfied that I made the right choice. It has some great features outstanding display with really good colours , games look fantastic. As with most ips panels there is a little backlight bleed but not noticeable. It is expensive but also very high quality and would recommend this monitor oh and it has rgb !!! excellent service from Scan my go to site for pc components. Rated 5 out of 5 by Infer32 from Decent monitor for the price! Great monitor. Vivid colors! One dead pixel. Backlight bleed wasnt that bad in comparison with other IPS monitors. Overall a decent IPS monitor with gaming design! Rated 5 out of 5 by Obsequey from Delivers everything promised Just received mine today. Was trying to find a new display that suits me for a couple of years and surprisingly Gigabyte's first monitor solved this. Had some bad experience with other IPS displays, this one just performs as advertised. Of'course blacks can be better, but in general are good enough. Very minor blb/glow, compared to other IPS displays is practically non existent. I notice it only when specifically testing for it. Fortunately no dead pixels. Out of the box calibration is ok, but after actual calibration gets even better. Also did some G-sync testing (with the current Nvidia drivers), works pretty good. Rated 5 out of 5 by Pizza1337 from Best monitor out currently of the money! i received this monitor with no dead pixels, no back light bleed and with minimal ips glow which is amazing as every other ips monitor i had that stated that i has perfect panel quality was a lot worse than the Aorus. the motion is a lot better than the samsung chg70 and it has a better variable refresh rate range with frc! overall this monitor is the best monitor out currently for the money as its more accurate than the asus pg279q and has hdr and gsync support thanks to nvidias new release. What cables are included with this monitor, please? Does Gygabite add any games, please? I need to know How long the DisplayPort and HDMI cables are before i get this monitor just in-case the cables are too short so i can add some to basket.